Herman Cain, the Georgia businessman who has never held elected office, is tied for the lead in national polls of Republican voters — or perhaps even slightly ahead of Mitt Romney, as he was in Tuesday night’s New York Times/CBS News poll. Mr. Cain has also led in most recent polls of the Iowa caucuses and the South Carolina primary, has taken the lead in Ohio, and is close to Mr. Romney in Florida. If all you had to go on was the polls, you might think that Mr. Cain was the favorite to win the Republican nomination. But then there are the nonpolling factors, some of which can be objectively measured and some of which cannot, but which would generally point toward Mr. Cain as being a second- or third-tier candidate. Mr. Cain has no endorsements from Republican members of Congress or Republican governors, and very few from officials in key early voting states. He has raised very little money. He has not hired well-known names for his campaign staff. He does not have traditional credentials. He has run for elected office just once before. He has begun to get a fair amount of media coverage, but the tenor of it has been fairly skeptical. His campaign commercials have been … interesting. 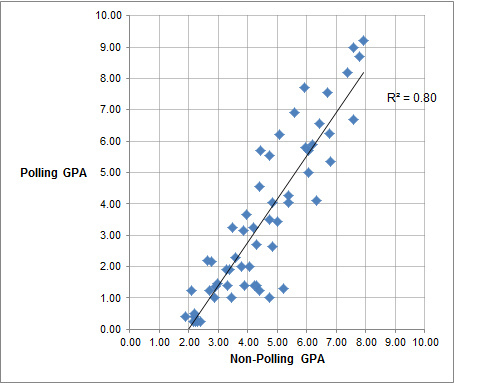 I’m working on a project that tries to assign grades to each of the Republican candidates in a wide variety of categories. Most of these, like polling numbers and establishment support (as measured through endorsements) can be quantified in some way, but a few like debating skill are more subjective. The categories are weighted and combined together, producing a grade point average (GPA) that runs on a scale from 0 to 10. I’ve also run these numbers for past presidential primary fields dating back to 1992 based on the information that would have been available as of about Nov. 1 of the pre-election year. This isn’t necessarily the most rigorous study; data on some of the objective factors is hard to obtain for past years, and as much as you might try to rid yourself of hindsight bias for some of the more subjective categories, it’s hard to trust yourself to do that when you know how the results turned out. In other words, by this stage in the race, the polling and the fundamentals usually match up pretty well. Where there are exceptions, and there haven’t been many, they are usually candidates who have strong fundamentals but weak polling, rather than (as in Mr. Cain’s case) the other way around. Prominent examples of this would include Lamar Alexander in both 1996 and 2000, Phil Gramm in 1996, and perhaps someone like Chris Dodd in 2008. Where would Mr. Cain fit into this chart? He’d be a huge outlier. If you knew only about Mr. Cain’s polling and were trying to predict how strong his fundamentals were based on the precedents established by past candidates, your initial guess would be off by about 4.5 standard deviations, which amounts to a 1-in-300,000 outlier. The fact that Mr. Cain has made it this far with such apparently weak fundamentals — we’re less than 10 weeks away from the Iowa caucuses — is itself remarkable. It implies that there is either something fundamentally unusual about this year’s Republican nomination process, or perhaps that some sort of “new normal” has been established and that the old rules of how you win a nomination no longer carry as much weight. Most of you, however, are interested in what will happen to Mr. Cain from here on out — can he actually win? What is an analyst to do when he encounters an outlier like this? Well, I don’t know what he should do. This gets at something of the distinction that the economist Frank H. Knight once made between risk and uncertainty. To boil Mr. Knight’s complicated thesis down into a sentence: risk, essentially, is measurable whereas uncertainty is not measurable. In Mr. Cain’s case, I think we are dealing with an instance where there is considerable uncertainty. Not only do I not know how I would go about estimating the likelihood that Mr. Cain will win the Republican nomination — I’m not sure that there is a good way to do so at all. But I do know what an analyst should not do: he should not use terms like “never” and “no chance” when applied to Mr. Cain’s chances of winning the nomination, as many analysts have. There is simply no precedent for a candidate like Mr. Cain, one with such strong polling but such weak fundamentals. We do have some basic sense that both categories are important. 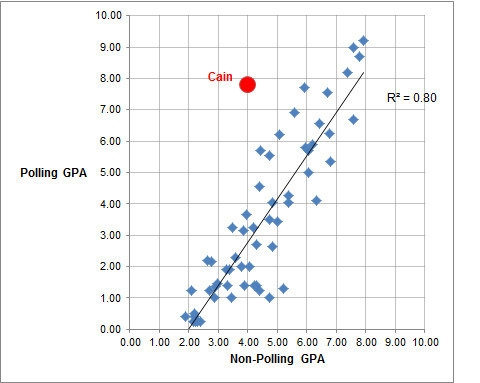 This evidence is probably persuasive enough to say that Mr. Cain’s chances are much less than implied by his polling alone. They may, in fact, be fairly slim. But slim (say, positing Mr. Cain’s odds at 50-to-1 against) is much different than none (infinity-to-1 against). We don’t know enough about the way these factors interact, and we can’t be sure enough that the way they’ve interacted in the past will continue on into the future, to say that Mr. Cain has no chance or effectively no chance. Frankly, I think it is quite arrogant to say that the man leading in the polls two months before Iowa has no chance, especially given that there is a long history in politics and other fields of experts being overconfident when they make predictions. One reason that experts make overconfident predictions is because they often aren’t held accountable when they are wrong. So in an effort to raise the stakes, I asked on my Twitter feed whether there were any experts willing to gamble their jobs on their predictions and would promise to stop writing about politics if Mr. Cain in fact wins the nomination. There is absolutely no reward to taking this bet — however, if you believe that Mr. Cain’s chances are truly zero, there is also absolutely no risk. I did get a couple of takers. Much to his credit, Dan Conley, a former speechwriter for Gov. Douglas Wilder, said he would “quit political opinion writing forever” if Mr. Cain is nominated. And Gary Connelly, who writes about politics for The Springfield Post-Gazette, said he would quit covering politics for The Gazette if Mr. Cain wins. I hope it doesn’t come to that; we have enough unemployment in this country. But kudos to Mr. Conley and Mr. Connelly for venturing out on a limb. Anyone else out there willing to join them?